The prominent South Indian movie actress Radhika is right now one of the most trending topics on the Google Search. The actress is none other than the second wife of the next Karnataka chief minister HD Kumaraswamy, who is set to take oath next Wednesday. It’s not just Kumaraswamy that is of interest to social media but also his family. Radhika, who is also a film producer, is quite a popular face in the Kannada film industry and has also acted in Tamil and Telugu movies. In her successful career, she worked with many stars, including Ravichandran and Upendra, before marrying Kumaraswamy in a low-profile, controversial wedding in 2006. Kumaraswamy, who runs a successful film production and distribution business, was the Karnataka CM in 2006-07. Radhika reportedly married Ratan Kumar at the Sri Durga Parameshwari Temple, Kateel on 26 November 2000. Later, Radhika’s mother wanted the marriage to be annulled as Radhika was just 14 years old and said that Ratan Kumar had forcibly married her. Ratan Kumar died in August 2002, following a heart attack. Radhika had made her debut in the film industry when she was 14-years-old. On 18th May, her name was the most search on Google and she was on the top of Google trends. 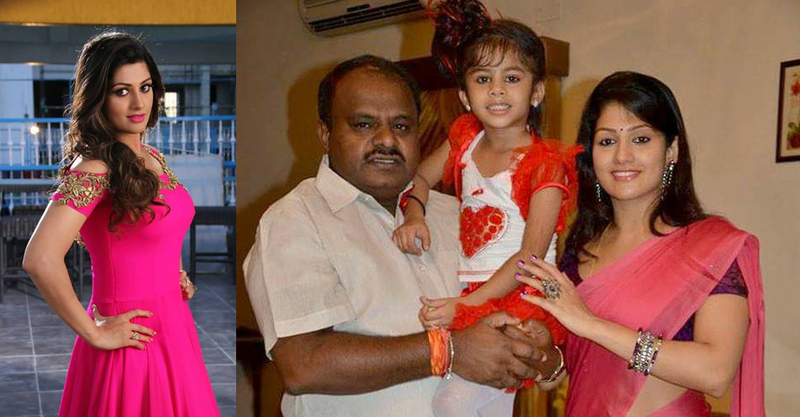 Kumaraswamy and Radhika got married in 2006, which was the year in which Kumaraswamy become the CM of the state. The couple had one daughter named Shamika K. Swamy. The marriage came to light after famous south Indian actress and Congress leader Ramya exchanged barbs with HD Kumaraswamy, who drew first blood by launching a verbal attack on her, according to a report on India Today. Apparently, Radhika’s marriage to HD Kumaraswamy’s was kept under the wraps until this spat between Ramya and HD. Radhika stayed away from the limelight and returned to the industry as a producer with Lucky in 2013. After tasting success as a producer in her first movie, Radhika made a comeback to acting with Sweety Nanna Jodi and subsequently worked with Chiranjeevi Sarja in Rudra Tandava.